The Douglass County Sheriff’s Office says the shooter is dead, according to the L.A. Times. They still have not been identified. A tentative report indicates the shooter may have announced their plans on 4Chan last night. Oregon Governor Kate Brown says the shooter was a 20-year-old male . We still don’t know whether he killed himself or was shot by police. 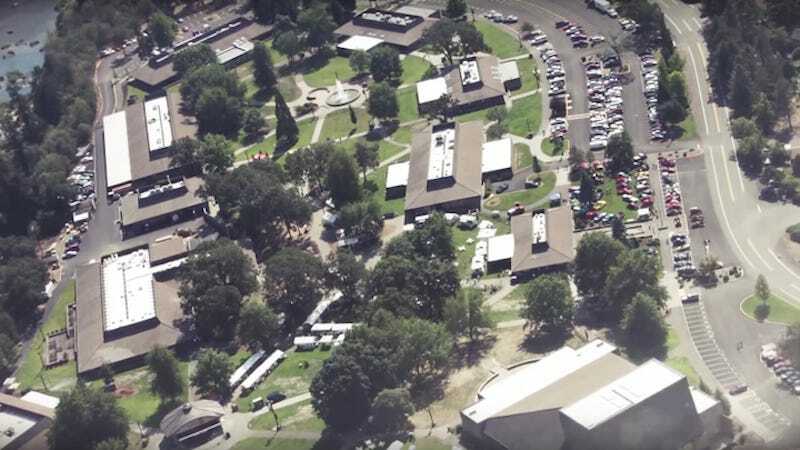 Breaking news reports are indicating that there’s a mass shooting incident underway at Umpqua Community College in Roseburg, Oregon, about 180 miles south of Portland. Around 20 people were reportedly injured. CBS, citing local law enforcement sources is reporting that 10 people have been killed and six are in critical condition. The school’s website appears to be down, likely flooded with traffic in response to the news. The latest live news reports indicate that the shooter, who has not been identified, has been shot. Reuters puts the number of people killed at 15. KGW reports that the first 911 call from campus came at 10:30 a.m, according to the Douglass County Sheriff’s Office. The call said there was an active shooter in a classroom. We still have no information about the identity of the shooter, but the sheriff’s office has officially confirmed the incident is over.